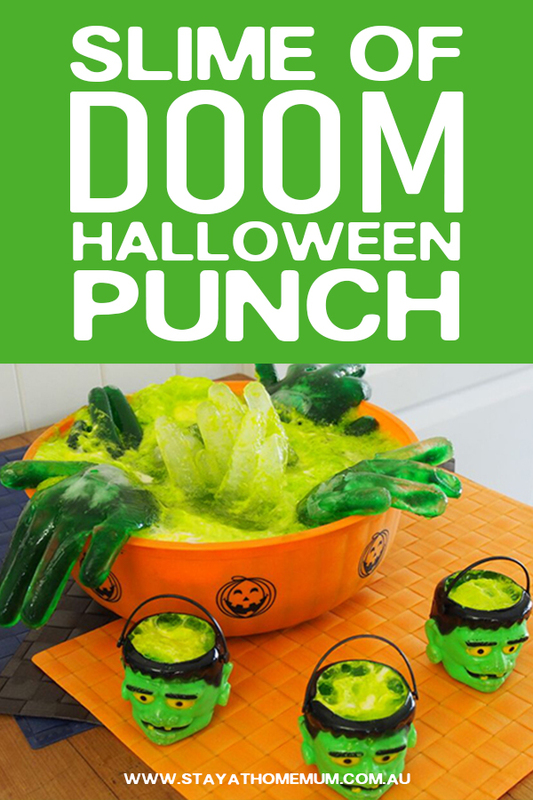 Slime of Doom Halloween Punch Halloween is just around the corner and everyone’s gearing up with ideas and costumes. Here is a disgusting slimy drink the ghoulies in your family will love!! Halloween is just around the corner and everyone’s gearing up with ideas and costumes. Here is a disgusting slimy drink the ghoulies in your family will love!! Fill 3 clear kitchen gloves with water and tie knot in wrist to seal. Place a flat tray and freeze overnight. Fill 3 clear kitchen gloves with water and add 2 drops of green food colouring, tie at wrist to seal. Place hanging over items or shelf in freezer so that you can hang them over the edge of the punch bowl when frozen. Make lime jelly as per packet instructions and allow to set. Pour lime fizzy drink into punch bowl. Add jelly in one large lump as some will melt and break away. Now add 3 tablespoons ice cream in small scoops mixing so that mixture starts to froth. Place clear Frankenstein hands in bowl and drape green ones over the edge of bowl. Slime of Doom is not suitable to freeze.